With recognizable brands and eye-catching messages fluttering among dazzling colors, advertising flags are one of the most effective ways to catch the wandering eye. 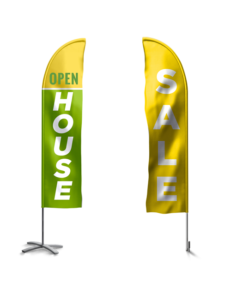 For the many businesses that often see hundreds – if not thousands – of potential customers pass by their storefronts every day, flags can be the most effective medium for promoting sales, events, and more. 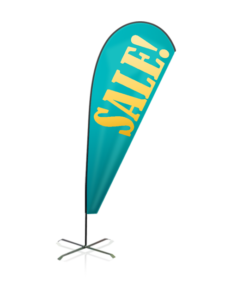 Dollar-for-dollar, advertising flags can deliver a far greater value than other promotional efforts. Effective Advertising: Commercials, web advertising, and other conventional marketing methods can only go so far; almost all of these will inevitably escape a large percentage of the local population. An advertising flag, however, can do a lot more for a lot less money. Placing flags in high-traffic areas such as sidewalks can effortlessly convey marketing communications to thousands of people over the course of a single day—all for the cost of a flag or two. Professional: Like many other forms of print advertising, a custom-designed flag conveys a sense of professionalism that can help set the right impression for potential customers, investors, and more. Inexpensive: With prices starting well under $125.00, advertising flags are one of few mediums that can simultaneously capture large audiences and build a brand reputation on the cheap. Choosing the right flag can mean the difference between a tall, dazzling display and a flopping, unreadable mess blowing around in the next storm. 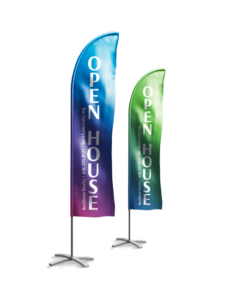 Flutter/Feather Flags: Feather flags – also known as flutter flags – are tall displays offering a squared bottom, providing the most square-footage of any flag. While this makes them particularly effective at displaying promotional material, their free-flowing nature can obscure messages in heavy winds. However, calm winds provide the flag with gentle movement, resulting in a dazzling and eye-catching display. Teardrop Flags: Unlike the squared bottom of feather flags, teardrop flags taper off at the base, resulting in their namesake “teardrop” shape. Although this results in less square footage than feather flags, this unique shape stays perfectly taut in high winds, making them perfect for any outdoor application. Regardless of the type of flag you choose, it’s important to take quality into account. Synthetic materials – such as polyester – prove to be the best for flags, as they are more capable of withstanding the elements and are less likely to wrinkle. The best flag poles are also made from synthetic materials such as fiberglass, allowing them to bend with the wind. By their large, eye-catching nature alone, advertising flags are effective in almost any environment for almost any promotional purpose. Retail Stores: Most retail stores are largely dependent on receiving physical customers. With advertising flags, retail locations can advertise their location and promotions to a large number of potential customers. Trade Shows and Conventions: At large trade shows where booths can stretch for hundreds of feet, businesses and organizations stand the risk of blending in with everyone else. With a colorful flag displaying brand logos and other material, attending businesses can stand out from the crowd and provide guests with an easily recognizable landmark. 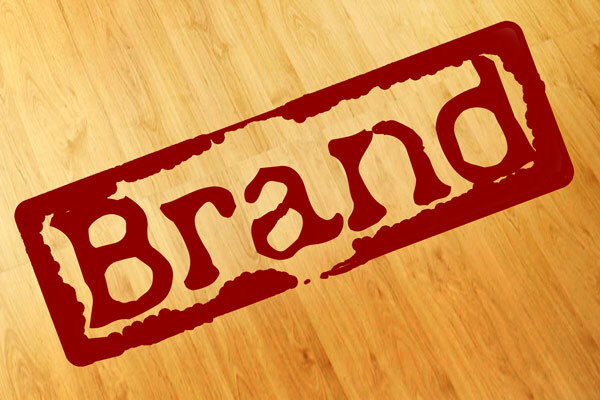 General Advertising: Regardless of its specific industry, any business can use flags to advertise their products, services, and promotions. For example, a car dealership could have a flag outside the lot announcing a new shipment of vehicles or new service promotions. Electro Image offers a one-stop solution for all of your business’ flag printing needs. Whether you have your design already created or wish to utilize our graphic design team, Electro Image of St Louis, MO can print long-lasting, full-color custom designs on a flag of your choosing. Our flags come in a wide range of styles and sizes, each one made from 3-ounce weather-resistant polyester supported by an adjustable fiberglass pole. With long-lasting color life created by our dye-sublimation printing process, your custom advertising flag will stand proud for years to come.